On the best summer days, the ocean blesses the Cal Lutheran campus with cooling breezes. And the university reciprocates by sending back to the Pacific some of its best water men and women to protect millions of beachgoers each year from the dangers that lurk in the surf. This arrangement keeps flowing in part because of the ambassadorship of water polo coach Craig Rond, an L.A. County lifeguard for more than 30 years. “Craig is a good rep to get people into the program,” said Cody Shirk ’09, a lifeguard and private-equity entrepreneur. Not only does he encourage Cal Lutheran students to try out, said Shirk, but teens who aspire to become lifeguards are drawn to the university because of the number of its students who qualify for this selective program. Despite his passion for the work, Rond quickly dispels the glamorous image of the job as portrayed in the ’90s TV show Baywatch. A drowning victim once spewed pink vomit on Rond as he administered CPR. A young woman high on drugs and sinking fast resisted his efforts to take her to shore because she insisted she was a flying fish and the ocean was her home. Only when they reached the sand did he realize she was naked. “You can see stuff that can’t be unseen,” said Shirk, a former Santa Monica City firefighter and senior partner with Syft Ventures of Malibu. To the man and woman, though, each lifeguard will tell you that the Darwinian tryout, the rigors of the boot-camp-style academy and the no-excuses accountability were worth it. Few alumni view lifeguarding as their year-round career. Most join the ranks of the seasonal crew, for financially and personally rewarding work that can span decades after graduation. For student-athletes who want to stay above water in their classwork, lifeguarding proves an ideal summer job, Rond said. With a starting pay of $25 an hour, undergrads can earn enough in a summer to cover books and living expenses. Along with boosting the bank account, it builds character. On the annual tryout day, several hundred expert swimmers, some of them Olympians, line up on the sand of Dockweiler State Beach in L.A. to outswim each other on a 1,000-meter course — all at the same time. Depending on the year, only the first 50 or 75 to finish will advance to the next stage. Women are cut no breaks. They compete with the guys on the same course. “I was literally eye to elbow with men’s varsity swimmers,” said Kristi McGee, an exercise science major and water polo standout who qualified for lifeguard duty in 2013. Her prowess in the surf served her well during the Fourth of July weekend 2014, when the exercise science major hit the water 25 times to rescue 15 swimmers in one day. Meredith (Butte ’11) Shirk likens her audition to a wrestling smackdown at sea. “You are getting kicked and punched in the head as you literally fight for the job. It’s definitely not a leisurely swim on the French Riviera,” said Shirk, a fitness entrepreneur and real-estate investor along with her husband, Cody. Competitors who reach the shore in the first wave, like McGee and Shirk, must then quickly change into business attire for a demanding job interview. Only a fraction pass the interview and the background checks to gain admittance to the academy — four weekends of grueling training. The curriculum is designed to make lifeguarding anything but a sink-or-swim proposition. Shirk found herself tested early in her time at the academy on Zuma Beach — the stretch of sand reputed to have the gnarliest waves in Los Angeles County. She spotted a teenager caught in a rip current. When she swam to the girl’s aid, the 16-year-old was in full-blown panic in tall surf. Despite her own fears, the Division III National Water Polo Player of the Year kept her cool and applied the techniques she learned in the academy to reassure the victim that they would make it together. Soon the girl was back in the arms of her grateful mom. 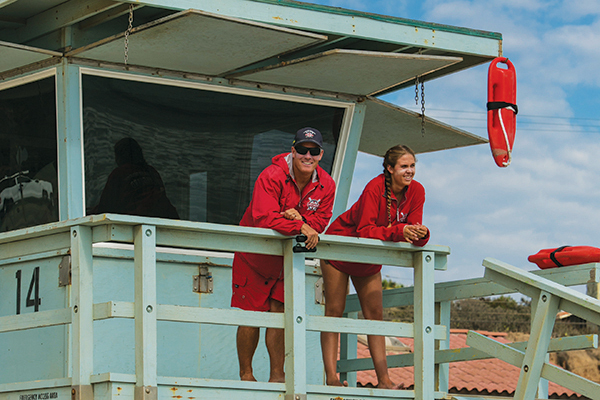 Most Cal Lutheran students who become L.A. County lifeguards progress naturally into it from Junior Lifeguards or the state beaches program. But a few say they never would have tried out without Rond’s prodding. Water polo coach Craig Rond (left), a Los Angeles County lifeguard for more than 30 years, has helped open the opportunity to student-athletes like McGee. Cal Lutheran’s second all-time leading scorer in water polo, Gross now teaches seventh-grade math and serves as athletic director at Hillcrest Christian School in Thousand Oaks. For him, lifeguarding in the summers provides year-round income, he said. Condron decided to leave the lifeguard ranks a couple years ago as the demands of his young family and his accounting career grew, but he harbors no regrets for the time and effort he sank into it. “You get out of your comfort zone. You encounter life-and-death situations, so it helps you grow up pretty quickly,” he said. Now 51, Rond plans to lifeguard until he is 70. Aside from keeping him fit, the work supplies satisfaction few people ever experience, he said. “At the end of the day, you close up the tower and realize people are home and safe because of your watch,” he said. But that feeling of fulfillment comes at the cost of eternal vigilance — even when off duty. Colleen Cason is an award-winning journalist and longtime columnist for the Ventura County Star. A Thousand Oaks resident, she has served as adviser to The Echo student newspaper and as a communications specialist for nonprofit organizations.